AnonD-147377, 21 May 2013Is this the phone that took you a year to build? A downgrade version of Lumia 920!Its not meant to be a 920 upgrade, its basically the same phone but in a different profile. 920 had just been released 6 mos ago. Mark, 21 May 2013Only lamers think 13 megapixels is better than 8 megapixels.yeah, and taht carl zeiss optics which nokia used help a lot. my brothers old nokia express music with 3.2mp carl zeiss capture better than my samsung 5mp. Is this the phone that took you a year to build? A downgrade version of Lumia 920! Only lamers think 13 megapixels is better than 8 megapixels. There are some clear drawbacks on it. Small battery... if it was impossible for Nokia to fit higner capacity battery in to this case, why did they then go for the pertruding lens? They could have gone for a bulging back as on the 920, to fit a larger battery inside. 2000 mAh will not feel enough, and WP8 has not been the best OS for battery performance in the past. Bluetooth 3.0 That pretty much rules out every viable heartrate monitor on the market, and probably a lot of future bluetooth accessories like smart watches and headsets with mighty standby performance. When it comes to things like CPU, well Nokia had no choice, and the current chipset is pretty good, although a little more graphics performance would be nice. Megapixelcount, well it should be fine for most occasions. And its not the measily 4MP of the HTC One, this sensor can provide a good balance between pixels, imge performance, low light performance. No 1080p screen, well that is overkill on a device like this, really... The thing I'm curious about is the pixel allignment, it's said not to be pen-tile, so hopefully there is a full set of sub-pixels, if there are fewer than three, well, then the subpixel resolution would be a downer. The OS, well, it's fine. Android isn't really a option. And a OS of their own would be problematic to get apps developed for. And the future of Windows seems to be a lot of sharing of the sourcecode between the phone edition and the desktop one, and that is a good future vision (in the lines with what made MeeGo promising). Design, well, that is a matter of taste. I only hope that Nokia will realize that there are gaps to fill in the market. hardware qwerty phones with top specs. Well this phone does not have top specs in comparisson with some Androids, but good enough, so a qwerty version would not feel like a buydown. And slimming the bezels, could make a version of this viable for a lot of people that have hard times handling big screen phones. Like the petiton by GSMarena is asking for. if Nokia has a 5" model in the pipelines, they should make a 4.3 or even 4.2 version of that phone with pretty much the same performance. A 5" would probably be expected to have 1080p screen, so they could make the smaller with this resolution, and possibly slightly less powerfull chipset to result in pretty much the same performance. If this was launched instead of 920 it would be a best seller, haters bashed the 920 mostly on thickness and weight, what could they say for this? It's still wonderful for the moment, but actually it loses an edge to quadcores, 2gigs of ram, adreno320, 1080p, 3000mah, 32gigs storage, phones. Because in just a few months it will be considered outdated, WPos and WP apps are developing very fast and soon it will require higher specs to be considered a high end smartphone. How much (available) storage the 16GB model has out of the box?? Available storage (free to use) not the total storage..
Firion, 21 May 2013Bad decision Nokia with WP. Good phone unattractive due to the OS. Glance clock improvement???... moreThis phone has AMOLED screen so that clock screensaver is always turned on (can be turned off as well) even on standby. S40 phones don't have AMOLED thus don't have this feature. This feature originally came from Symbian^3 and later was brought to the Nokia N9 and is now on Windows Phone. Even the FM radio feature which was initially not supported by Windows Phone is now unlocked via Amber update. I believe more and more features that people grew accustomed with the past Nokia Symbian phones will eventually make their way to Windows Phone. Kopi-O-Siew-Dai, 21 May 2013No in fact I prefer static icons. Because tiles are really meaningless to me as I hate the ide... moreYou want static icons? I assume you're using an iPhone. Too bad Apple is going the flat UI design route as Windows Phone next with their iOS7 where there is also some sort of tiles/cards that will replace the static icons. But you can always opt not to upgrade and be stuck with a 2 decade-old icon-based user interface if you hate change. Kopi-O-Siew-Dai, 21 May 2013No in fact I prefer static icons. Because tiles are really meaningless to me as I hate the ide... moreAre u loosing sleep because of WP. My advise is just throw away. Anonymous, 21 May 2013Live tiles are awesome. Are you mistaken them for static icons?No in fact I prefer static icons. Because tiles are really meaningless to me as I hate the idea to pin apps on the start screen in order to receive updates or know what had happened. All the vertically scrolling in order to see what's new is a nightmare for me. Kopi-O-Siew-Dai, 21 May 2013Nokia phones are great. But whenever I see those tiles, they send shivers down the spine.... J... moreLive tiles are awesome. Are you mistaken them for static icons? Nokia phones are great. But whenever I see those tiles, they send shivers down the spine.... Just so creepy and ugly... Modern UI my foot. Ad, 21 May 2013Nokia really offers a great features in their phone.everything are premium. Nokia's build qual... moreBricks always have good build quality - it's a proven, age old fact! Everytime I look at WP I jst can't believe how any1 can put such a dull, odd looking, nearly monochromatic arrangement of tiles on a modern phone or desktop (Win 8) screen! They're more reminiscent of 70s arcade games than a modern OS - more retro than metro! WP and Win 8 look positively outrageous! Yuck! Wish Ballmer'd stuck wth the Win 7 themes or improved upon 'em- they look n feel n work infinitely better! Then again, Ballmer has no b*lls! Lol! Aadrian, 21 May 2013Great phone, but I will keep my Lumia 920 and wait for the next Nokia flagship.The Lumia 925 looks really nice. 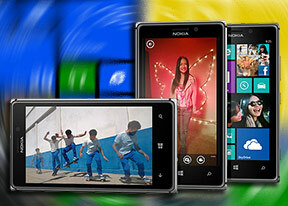 Added with Nokia's superb Camera tech and smooth WP8 operation. This is the Best Windows Phone and probably the best camera phone to date. I'm still holding on to my 920 tho, waiting for the Lumia EOS.